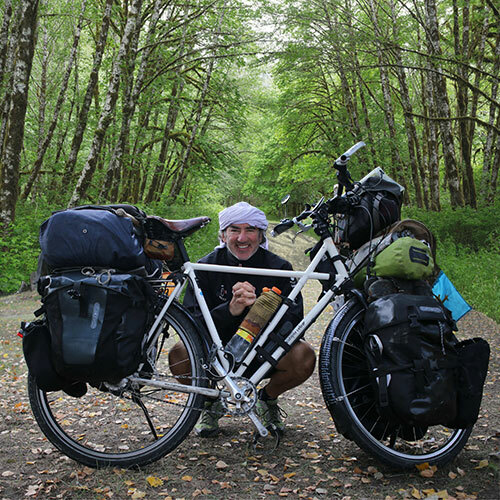 If you open the bike panniers of Alvaro Neil (from Spain, born in July 1967) you will immediately recognize that he is not a normal bike traveler. There are not many cyclists taking along in their luggage a clown’s nose, makeup and magician accessories. During his trip through Latin America (2001 to 2003) he cycled 31000 kilometers and performed 50 free-of-charge clown shows for the poorest of the poor. His new challenge is cycling around the world by himself and without any stops (2004 to 2017). Up to now he is one of the few cyclists who biked along both coasts of Africa: Meanwhile he travelled to 112 countries and covered 200,000 kilometers. His mission is to make the world laugh with his bicycle.